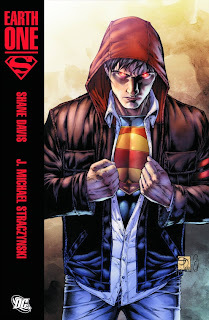 Yesterday saw the release of SUPERMAN: EARTH-ONE, by J. Michael Straczynski and Shane Davis. Instead of me describing it first, here's the official solicitation from DC Comics. Forget everything you know about The Man of Steel and brace yourself for a staggering new take on the world's most popular Super Hero. Best-selling, Hugo Award-winning writer J. Michael Straczynski (BRAVE AND THE BOLD, Thor, Babylon 5) and red-hot rising star artist Shane Davis (GREEN LANTERN, SUPERMAN/BATMAN) team up for this exciting launch of the EARTH ONE graphic novel series. Set in an all-new continuity re-imagining DC's top heroes, EARTH ONE is a new wave of original, stand-alone graphic novels produced by the top writers and artists in the industry. The groundbreaking new line rockets into effect right here with the Super Hero who started it all – Superman! What would happen if the origin of The Man of Tomorrow were introduced today for the very first time? Return to Smallville and experience the journey of Earth's favorite adopted son as he grows from boy to Superman like you've never seen before! So basically, it's a Superman for newer readers. Now, you may ask, "Duy, you love Superman! And you love bringing in newer readers! When are you going to review SUPERMAN: EARTH ONE?" Uh, I won't. For a variety of reasons. First of all, I'm not the biggest JMS fan in the world. His run on AMAZING SPIDER-MAN, while acclaimed, was one of the worst ever in my eyes, and I just hate it. His work on SUPERMAN right now is boring, and the one comic book from JMS that I actually liked, THE TWELVE, was pretty much eight issues of slow set-up, and was never finished. He's just not a favorite of mine. Secondly, I'm not a fan of the art either. Shane Davis is a decent artist, but I don't think he's good enough to be on a project as big as this. Solid, can tell a story well, but I think his work lacks refinement. Third and most importantly, meh, I just don't need it or feel like it. And that's not because it's being hailed as a hipster version of Superman or a Superman for the "Twilight" generation. I just don't feel like it. How many "coming of age" Superman stories are we going to see? We've got the entire run of SUPERBOY from the Golden/Silver/Bronze Age, John Byrne's MAN OF STEEL, Mark Waid and Leinil Yu's BIRTHRIGHT, and most recently, Geoff Johns and Gary Frank's SECRET ORIGIN (which I bought on the basis of Gary Frank's Superman being awesome). In other media, we've got the first Superman movie, and we've got Smallville. Every time, it's updated for the new generation. I get it. Now, looking at the previews, it seems that this Superman is one that is unsure of himself and is also drawn in such a way that doesn't really call Superman to my mind. And that's cool. That's fine. 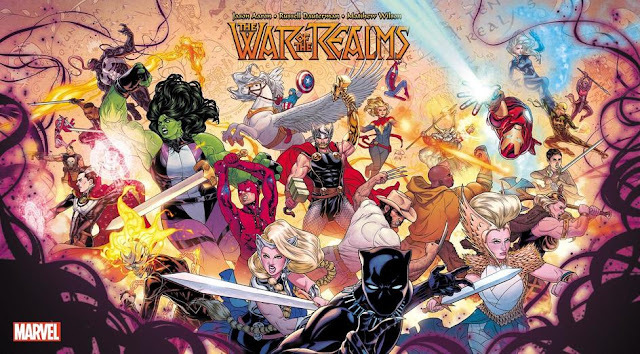 If it gets new people reading comics, then that's cool. I'm fine with that. Their Superman may not be "my" Superman, but I'm not going to go spend money on the book, read it, and then go on a big rant about how it's not "my" Superman. Superman is open to many interpretations. This one just seems to be one that's not for me. "Superman is open to many interpretations. This one just seems to be one that's not for me." So many so called fans fail to realise this and want this wonderful, enormous, mythic character boxed in and confined to resemble whichever interpretation they happen to prefer. It's refreshing to read someone online saying that they don't care for a particular interpretation of the character without declaring that the character is now ruined forever and claiming that DC is involved in some conspiracy to deliberately ruin their flagship character. I am more leaning toward the "how can you keep on telling the same story for a 'new generation' and not seem dull" position. I mean, granted it happens from time to time, but it seems that with bigger names, they do it too frequently. I am just waiting for the umpteenth Batman reboot and for Green Lantern to get his again (I mean it's been what like 5-6 years?). I just want a good, enjoyable story, which is why I read Booster Gold when I can. He isn't important enough to generate repeated origin stories. Paul: Ehh, Spider-Man survived cradle-robbing Norman Osborn and emotionally weak and sexually open Gwen Stacy, Batman survived Batdick, Captain Marvel will survive Geoff Johns, and Hal Jordan survived EVERYTHING everyone ever threw at Hal Jordan. I think it's safe to say that you can't "ruin" any character forever. Matt: I completely agree. They're rebooting the Spider-Man movie franchise, and my initial reaction was "another origin? Really?" It drives me nuts. I get it. Where Will The Comics Cube Be This Weekend? Help Out Steve Rude. Buy Original Art! Easter Eggs in Comics: The Human Torch in Trese!